Our End Grain Flatbread Board is useful in so many ways and is oh so beautiful! Hand crafted in Door County, WI, this board is great for serving flatbread, appetizers, tamales, cheese and fruit and so many other things that I'm sure we all can think of! This board is a must have! Group picture shows from left to right: cherry/walnut, cherry, cherry/walnut. Dimensions are 6" x 24" x 3/4". Available in Cherry, Maple, Walnut and Cherry/Walnut Combination. Add some beautiful hand crafted tongs to make it a set. Hand wash and towel dry. Do not put in the dishwasher. 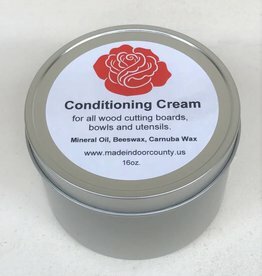 Don't forget our wood conditioning cream to keep your Flatbread Board looking amazing!